Congenitally prominent ears are a cosmetic deformity that can have a severe emotional and behavioral effect on a child. Otoplasty is a description of surgical procedures designed to give the auricle a more natural and anatomic appearance. In 1845, Dieffenbach described correction of a posttraumatic auricular deformity. In 1881, Ely first described cosmetic otoplasty. He performed a wedge excision of full-thickness skin and cartilage from the conchal bowl to reduce the prominence of the ear. Throughout the 1890s, numerous skin and cartilage excision techniques, aimed at reducing noticeable scarring, were used by Keen, Monks, and Cocheril. These procedures were further advanced during the first 2 decades of the 20th century by Morestin, who excised elliptical pieces of skin and cartilage in 1903; Luckett, who attempted to reconstruct the antihelical fold in 1910;  and Kolle, who contributed to mobilizing the "springy shell of the ear" by linear incisions in 1911. An image depicting otoplasty landmarks can be seen below. Over the course of the next 20 years, tissue grafting became a popular practice; however, according to Alexander (1928), Demel (1935), and Eitner (1937), each of whom used conchal excisions, sharp cartilaginous protrusions and wrinkling of the skin often remained. By the 1940s, New and Erich used mattress sutures to maintain the stability of the antihelix and found that shaving the cartilage was just as adequate as excising whole fragments. The Mustarde technique, which uses permanent mattress sutures to maintain the superior crus, gained popularity in the 1970s because of its efficiency. The use of permanent mattress sutures to re-create the antihelix remains in practice, as does postauricular soft-tissue excision for the correction of deformed auricles. Most surgeons now perform cartilage-sparing otoplasty, in which cartilage is neither incised nor excised to achieve the natural folding of the cartilage. Prominent ears typically do not affect a child's self-image until the child is older than 5 or 6 years, and surgery for prominent ears is best performed by age 6-7 years. Conversely, adult patients often seek otoplasty to correct a long-standing defect. Before surgery, patients typically style their hair to camouflage their deformity. Postoperatively, patients often feel comfortable enough to wear their hair short or combed back. Five percent of white individuals are affected. Protruding ears are genetic; 59% of affected individuals have a family history, and transmission is in an autosomal dominant pattern with variable penetrance. Since the inner ear develops independently from the auricle, patients with prominent ears generally have normal hearing; however, other congenital deformities (especially of the genitourinary tract) may be present. 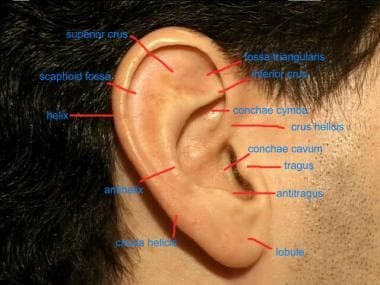 The auricle is fully shaped at birth. It achieves 85% of adult size by age 3 years and is nearly adult size by age 5 or 6 years. As an individual ages, elongation of the lobule gives the appearance of ear growth. Streeter believed that the shape of the auricle is predetermined, rather than influenced by any folding process. During 8-12 weeks' gestation, the helix develops rapidly and overhangs the antihelix. Despite Streeter's theories, most embryologists believe the antihelical furl develops over the subsequent 4 weeks, medializing the helical rim. The furl of the helical rim develops during the sixth week. Prominent ears can be in a myriad of forms, including cup ear, shell ear, bat ear, Machiavellian ear, and lop ear. Many patients attempt to camouflage the deformity with hairstyling. Question patients about excessive bleeding, poor wound healing, and keloid formation. A patient must also be judged to be intellectually and emotionally mature enough to cooperate with the postoperative regimen. Perform a general assessment of the auricles. Asymmetries and irregularities should be noted and discussed with the patient. Auricles should measure 5-6 cm in height, and the long axis should recline approximately 20° from the vertical plane. The auricle should diverge from the occipital scalp at no greater than a 35° angle. The antihelix should form a 75-105° angle between the scaphoid fossa and the concha. The inferior crus is generally well developed, but the common and the superior crura can be affected. Isolated hypoplasia of the superior crus causes a superior pole deformity; if the common crus is also affected, the entire ear appears lateralized. The most common deformity seen in prominent ears is an underdeveloped antihelix at a greater than 90° angle, often observed with a prominent lateral projection of the conchal bowl. Additional deformities may include a superior pole deformity, a prominent lobule, or a Darwinian tubercle. Assess, measure, and document lateralization of the auricle. Document and demonstrate to patients (and/or parents) any preexisting asymmetry between the ears in size, shape, and position. Evaluate the helix for contour deformities, and assess its prominence at the superior pole, mid portion, and just above the lobule. Examine the antihelix for appropriate folding of the superior, inferior, and common crura. The lateral margin of the lobule should lie along the plane of an appropriately positioned helix. Prominence of the lobule may result from medial skin excess or an anterior cauda helicis; failure to identify and correct this anomaly may ruin an otherwise excellent surgical result. The lateral conchal wall may extend excessively and can cause excessive lateralization of the helix and antihelix despite appropriate antihelical folding. Take preoperative photographs in standard frontal, lateral, and oblique positions. Additionally, a bird's eye view from above and/or posterior views can help document lateralization. Close-up lateral and oblique photographs can aid in analyzing the particular deformities in each ear. Otoplasty is indicated for correction of ears that protrude more than 20 mm and at an angle greater than 35° from the occipital scalp. One or multiple malformed auricular subunits may be managed. The auricle is a fibroelastic cartilage structure medially covered by connective tissue and skin and laterally covered by skin only. The normal auricle measures approximately 6 cm vertically. The helical rim is generally 12-20 mm from the mastoid scalp. The auricle is a complex 3-dimensional structure (see the image below). The helical rim is a smooth, curved arch extending anteriorly into the crus helices. This structure divides the conchal bowl into the superior conchae cymba and inferior conchae cavum. The helix is separated from the concha by the antihelix, an inferior single structure that bifurcates into superior and inferior crura. The trough between the helix and antihelix is referred to as the scaphoid fossa, while that between the 2 antihelical crura is called the fossa triangularis. Inferiorly, 2 small excrescences of cartilage form the tragus and antitragus, separated by the incisura intertragica. The cauda helicis extends posteriorly to the antitragus, and the fissura antitragohelicina separates the two. A number of muscles insert upon the auricular cartilage. These muscles are rudimentary in most people. The superior auricular muscle inserts on the posterior surface of the fossa triangularis. The posterior auricular muscle connects the posterior auricle to the mastoid, while a number of poorly developed intrinsic muscles (ie, oblique auricular, transverse, antitragal, tragal, major and minor helical muscles) are located on the anterior and posterior surfaces of the auricular cartilage. The arterial supply to the auricle is derived from the posterior auricular (posterior auricular surface) and superficial temporal (anterior auricular surface) arteries, which are both end branches of the external carotid artery. Sensory innervation is from the auriculotemporal (V3) and great auricular (C3) nerves, Arnold's nerve (CN X), and twigs from the facial nerve (CN VII). Lymphatics drain to preparotid, occipital, and high jugular nodes. For more information about the relevant anatomy, see Ear Anatomy. Otoplasty is contraindicated in any patient with unrealistic expectations. Patients must receive appropriate preoperative counseling. Discuss existing facial asymmetries, and emphasize that a restoration of anatomic balance to the face is the goal of any surgery. Patients unable or unwilling to cooperate with postoperative care are not candidates for surgery. Advise patients with a history of hypertrophic scarring or keloids that these may occur after otoplasty, possibly distorting an otherwise excellent surgical result. Ely ET. An operation for prominence of the auricles. Arch Otol. 1881. 10:97-99. Luckett WH. A new operation for prominent ears based on the anatomy of the deformity. Surg Gynecol Obst. 1910. 10:635-637. Mustarde JC. The correction of prominent ears using simple mattress sutures. Br J Plast Surg. 1963 Apr. 16:170-8. [Medline]. Streeter GL. Development of the auricle in the human embryo. Contributions to Embryology. 1922. 14:111-113. Byrd HS, Langevin CJ, Ghidoni LA. Ear molding in newborn infants with auricular deformities. Plast Reconstr Surg. 2010 Oct. 126 (4):1191-200. [Medline]. Stenstrom SJ. A "natural" technique for correction of congenitally prominent ears. Plastic and Reconstructive Surgery. 1969. 42:189-201. Fritsch MH. Incisionless otoplasty. Laryngoscope. 1995 May. 105(5 Pt 3 Suppl 70):1-11. [Medline]. Romo T 3rd, Sclafani AP, Shapiro AL. Otoplasty using the postauricular skin flap technique. Arch Otolaryngol Head Neck Surg. 1994 Oct. 120(10):1146-50. [Medline]. Wright WK. Otoplasty goals and principles. Arch Otolaryngol. 1970 Dec. 92(6):568-72. [Medline]. Furnas DW. Correction of prominent ears with multiple sutures. Clin Plast Surg. 1978 Jul. 5(3):491-5. [Medline]. Sadhra SS, Motahariasl S, Hardwicke JT. Complications after prominent ear correction: a systematic review of the literature. J Plast Reconstr Aesthet Surg. 2017 Aug. 70 (8):1083-90. [Medline]. Papadopulos NA, Niehaus R, Keller E, et al. The Psychologic and Psychosocial Impact of Otoplasty on Children and Adults. J Craniofac Surg. 2015 Oct 20. [Medline]. Leclere FM, Vogt PM, Casoli V, Vlachos S, Mordon S. Laser-assisted cartilage reshaping for protruding ears: A review of the clinical applications. Laryngoscope. 2015 Sep. 125 (9):2067-71. [Medline]. Standard postauricular skin excision for otoplasty. Postauricular skin flap for otoplasty. Postauricular skin flap for otoplasty with lobular extension. Suture to medialize the superior pole. Preoperative view of prominent ear. Irregularity and sharp angles after cartilage-incision technique of otoplasty.